Welcome to the summer preview of the 2010 Michigan Wolverines. In this series of posts we'll dive head first into each position, providing in-depth analysis of all the main contenders and a little bit of speculation just for fun. All good previews have to start somewhere, and it only makes sense to start at the single most important position on the field. When 2009 ended, it seemed pretty clear that Michigan had two very unique and very different QBs to choose form for the 2010 season. Tate Forcier saw the bulk of the snaps in 2009, even with a concussion in the Iowa game, Forcier remained the go-to guy for the remainder of the year. His hero-like performances in the early part of the season against Western Michigan, Notre Dame, Indiana and MSU earned him the admiration of the Maize and Blue faithful. But mid-to-late-season struggles proved that he was still just a freshman, and had a ways to go before he solidified his position as Michigan's starting QB. As the season played out, and Forcier began to see more and more snaps and starts at QB, Denard was relegated to a backup role, and sometimes a non-existent role under center. It wasn't his lack of ability that kept him off the field, but rather his lack of precision throwing. He just didn't have the arm to compete with Forcier who had enrolled at UM 6 months prior and had that much more experience in the system than Robinson. By the time the Big Ten season started, defenses knew to not have to defend the pass when Denard was in the game. He was very one-dimensional, and not at all what Rodriguez's offenses want to be. But time is proving to be on Denard's side. Denard has clearly been very busy improving his throwing ability and overall knowledge of the playbook during the long off-season. In the spring game this year, he saw the bulk of the snaps with the starting group, and looked 100% more efficient and comfortable in the pocket than he did in 2009. He was suddenly hitting receivers in stride over the middle. He was checking down to TEs. He was spreading the ball around to RBs and slots WRs. All of the sudden, his first instinct wasn't to just take the snap and just scramble like it was last year. He's growing into a pass-first, run-second type of QB...one that suits his ability well. Tate looked very much like the Tate from last year in the spring game. What troubled me the most was that when he was forced to scramble, which was often, he would carry the ball in his right hand far away from his body...not protecting it at all. Its that carelessness that the coaches notice and use in making their decisions as to who plays and who doesn't. One of the areas we need to improve drastically is winning the turnover battle and maintaining ball-control. With a young defense, we need to keep them out of bad situations by keeping the ball safe. 2010 brings us yet another contender to the QB battle. 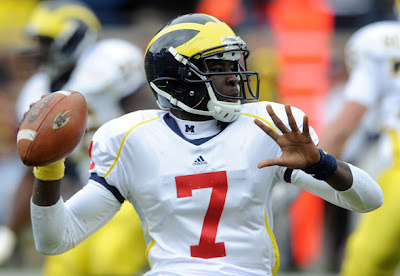 Incoming freshman Devin Gardner has been hailed as one of the top QB recruits of the 2010 class. The biggest asset he brings to the table is his size. Where as Denard and Tate are both a little shorter than I'd like them to be, Devin's 6-4, 200+ frame bodes well for him. He showed in the spring game (he enrolled in January) that he can move well with the ball. He's not as fast as Robinson, but resembles Vince Young in a lot of ways in how he moves. He has a ways to go before he's at the same level as his two other teammates in terms of knowledge of the offense, but there was a definite buzz around him in the spring game. My hope is that Devin can red-shirt this season and get another year of training and practice before he's thrown to the wolves. I hate the fact that we are getting into a habit of using freshman at skill positions...especially QB. Give him time to learn the system before he's forced to perform. But a lack of a true 3rd string option at QB, a red-shirt seems unlikely. All in all, 2010 is bound to see drastic improvement in the QB position for Michigan. Last year we had two freshman, and at times it showed. Expect a true 1st to 2nd year improvement in almost all phases of the game for both players. Prepare to see the two-QB system in effect at least in the first few games. It's clear that both Tate and Denard offer two different, yet two very capable options for Rodriguez. Denard may be the slight leader in the clubhouse going into the 2010 season due to his overall improvement in his throwing ability...at least the QB with the most momentum coming out of the spring sessions. Its clear that Rodriguez's spread-option style attack favors a "Pat White" style of QB, and that would bode well for Denard if he can capitalize on his spring success and continue to impress coaches and grow into a more pass-friendly, dual-option QB.